Readers really, really want to know what's happening to Bloodshot. So much so that Book of Death: The Fall of Bloodshot #1 has sold out of its first printing and will return to shelves September 2 with a second printing. Jeff Lemire and Doug Braithwaite team up to provide readers a glimpse into the future fate and ultimate end for Project Rising Spirit's indestructible commando in a special standalone tale bridging BLOODSHOT REBORN and BOOK OF DEATH! Sells Out, Second Printing Coming in September! 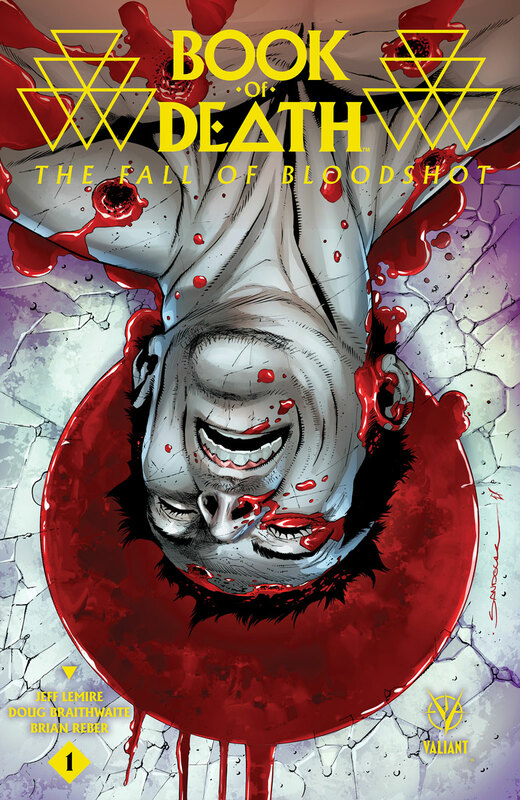 Valiant is proud to announce that BOOK OF DEATH: THE FALL OF BLOODSHOT #1 – the first of four standalone one-shots revealing the future of the Valiant Universe as told in the Geomancer's BOOK OF DEATH – has sold out at the distributor level and will return to shelves September 2nd with the BOOK OF DEATH: THE FALL OF BLOODSHOT #1 SECOND PRINTING! From New York Times best-selling writer Jeff Lemire (BLOODSHOT REBORN, Extraordinary X-Men), and superstar artist Doug Braithwaite (BOOK OF DEATH), jump into the cataclysmic event of the summer here with a journey across the centuries revealing the future fate and ultimate end for Project Rising Spirit's indestructible commando in a special standalone tale bridging BLOODSHOT REBORN and BOOK OF DEATH! On September 2nd, discover what the future holds for an indelible Valiant icon as all-star creators Jeff Lemire and Doug Braithwaite chronicle Bloodshot's future adventures in BOOK OF DEATH: THE FALL OF BLOODSHOT #1 SECOND PRINTING!